We investigated the distribution of extracellular matrix components such as fibronectin, laminin, type III, IV, V, and VI collagens and heparan sulfate proteoglycan (HSPG) in normal and diseased glomeruli using the indirect immunofluorescence method. This study included 96 renal biopsies: 7 controls, 3 minimal change nephrotic syndrome (MCNS), 47 mesangial proliferative glomerulonephritis (PGN), 25 membranous nephropathy (MN) and 14 membranoproliferative glomerulonephritis (MPGN) including 3 lupus nephritis. Fibronectin was detected predominantly in the mesangium and less prominently in the glomerular basement membrane (GBM) of normal glomeruli. Laminin and type IV collagen were present in the mesangium and GBM, type III collagen in the interstitium, and type V collagen in the mesangium, interstitium and a part of GBM. Type VI collagen was observed in the mesangium, interstitium and slightly in GBM. Anti-HSPG antibody reacted with the mesangium and GBM. MCNS showed a distribution of these antigens similar to that in normal controls. The finding that staining for HSPG was not decreased in the GBM and mesangium indicated that there was no change in the core protein of HSPG. Fibronectin, laminin, type IV collagen and HSPG were increased in the thickened GBM of MN and in the expanded mesangium of PGN. In MPGN, these matrix components were increased in the mesangium and GBM with remarkable increase of type V and VI collagens. While type III collagen was not found in normal glomeruli, it became detectable in the mesangium and a part of GBM in MPGN. No significant decrease in the intensity of fluorescence for HSPG was observed in the glomeruli from nephrotic patients. 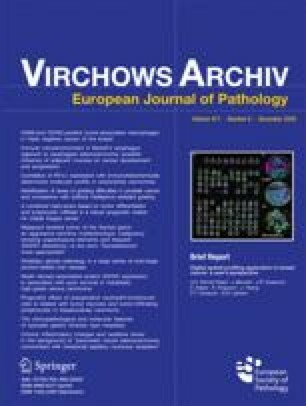 These findings suggest that proteinuria might be caused by the structural alteration in the glycosaminoglycan portion of HSPG, changes in any anionic material other than HSPG, or both, and also indicate that the glomerular mesangial sclerosis is closely related to the increase of type V and VI collagens.